One team treated some of their interviewees to a Hong Kong Hot Pot dinner. What better way to get a captive audience? 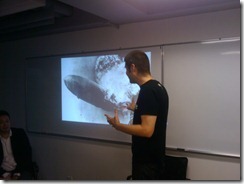 We also focused on presentation skills at our Friday meeting. 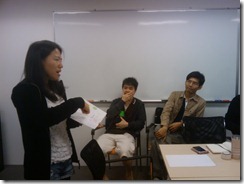 We had some founders give presentations about themselves and some do a Petcha-kucha. Lastly, we finally got our program director, Paul to loosen up and started a brand new Accelerator HK tradition, Friday Hoodie Day. 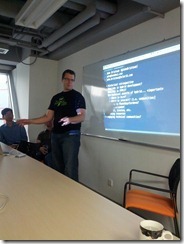 This week is a big week with mentors coming in, demos, and more customer discovery/validation. Stay tuned. 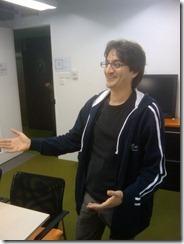 First was Salim Virani, the creator of Leancamp. He talked to us about Customer Development and took a lot of time out of his vacation time in HK to spend with the teams on how to ask the right Customer Discovery and Customer Validation questions. Later in the week we had Mikaal Abdulla, co-founder of 8 Securities, a Hong Kong startup success story, come in and tell us the story of leaving a well paying secure job and going out and starting a new business in Hong Kong, along with the war stories of raising money and some secrets to their brilliant marketing campaigns. 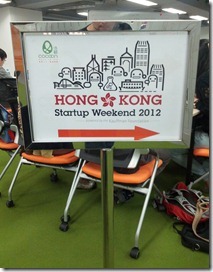 This past weekend was the 3rd Startup Weekend in Hong Kong and I was lucky enough to return again as a judge. This year it was huge with 14 teams competing! 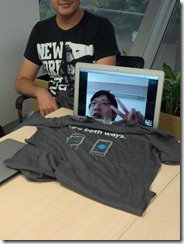 As usual, I was very impressed by the ideas, hard work, and execution. They stared on Friday night with lots of pitches and team formation. 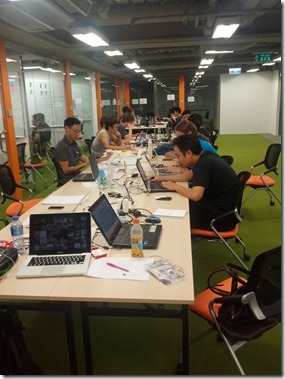 The group worked all day Saturday and Sunday at the CoCoon co-working space in Hong Kong (the same co-work space AcceleratorHK is using). 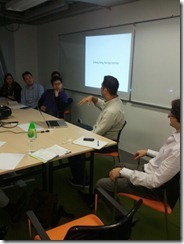 A few AcceleratorHK cohort members as well as program director Paul Orlando were helping out as mentors. On Sunday night we all gathered to a different venue where we heard all of the 14 pitches. 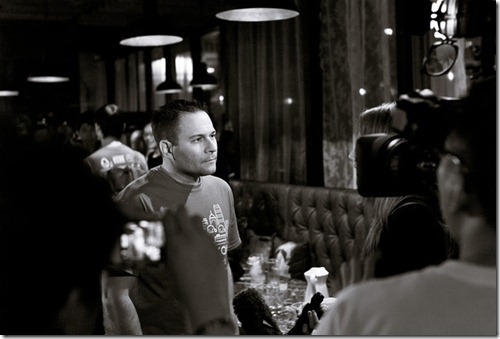 Myself and four other esteemed judges listened to the 5 minute presentations and lead the 3 minute Q&A session. The teams came from all walks of life as well as had ideas and teams that were in a variety of domains including: social, conference networking, kitchen rental, shopping, car sharing, film location scouting, and creative ways to use your free time. After the deliberation, which was close, we choose “FilmScout” as the winner. FilmScout was a team that built a solution for filmmakers and film students to find film locations to shoot in. While a niche market, they were a 100% solution to a market segment and demonstrated that they followed the Customer Development process over the course of the competition (which accounts for 1/3 of the judging criteria). 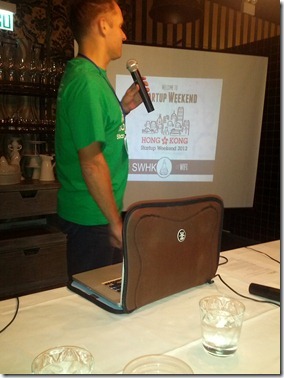 After the event there was some networking and I was interviewed on local Hong Kong TV about the startup scene in Hong Kong, AcceleratorHK, and of course my role as a judge in Startup Weekend. 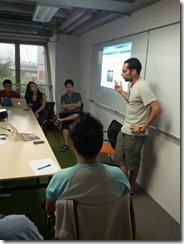 Last week was the first week of the AcceleratorHK program. We have six teams that make up this cohort coming from: Hong Kong, Silicon Valley, Mexico, and Malaysia. The teams are just starting out but are in the following domains: social, location based, and community. We started out with an introduction to Customer Development by program director Paul Orlando and then broke up the teams and gave them a Startup Weekend style assignment : go out and work on project for 48 hours with new teammates with a focus on Customer Development. The results were…interesting. We had two mentors come in and work with the teams. John Bristowe came in from Australia and spoke about HTML5 and Phonegap (since we are a mobile accelerator) and then provided technical training on KendoUI and Icenium. 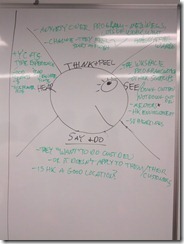 Shanghai based, Spanish investor Oscar Ramos also came in and did a great mentoring talk on Visual Thinking and how to use it as a tool in your customer development process. 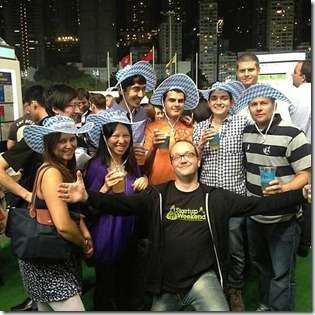 We even had time to hit the racetrack at Happy Valley on Wednesday night for Oktoberfest night for a cohort social. A great start to the Accelerator. Stay tuned for more updates.